This is the twenty-fourth mystery/thriller book by this popular author, this time set in France and England in 1919. The First World War has come to an end. In Paris there is a Peace conference involving the USA, UK, France and Italy. The Japanese are co-opted occasionally. James Maxted (Max) was a fighter pilot in the Royal Flying Corp. He is the second son of Sir Henry, owner of Gresscombe Place a stately home in Surrey. Max is friendly with his chief mechanic from the war – Sam Twentyman and together they hope to run a flying school on some of the Maxted land. He learns from his mother that his father has died. Sir Henry was an adviser to the British contingent in Paris. Max and his elder brother Ashley (there is no love lost between brothers and Ashley’s wife Lydia is usually fuelling their arguments), travel to Paris. Apparently their father died in suspicious circumstances and was involved with a Madame Corinne Dombreux, who is a widow of a man believed to be a traitor to his country. Max believes his father was killed and despite angering Ashley, refuses to return home with their father’s body and begins to investigate. Along the way he meets some colourful characters: Travis Ireton (an American fixer) and his associate the powerfully built Morahan; Appleby from the British secret service; Baltazar Riberio, a Brazilian diplomat, and a good friend of his father; Kuroda from the Japanese embassy who befriended Sir Henry when he was in Japan; Lionel Brigham, a British delegate and ex-lover of Max’s mother who believes he is Max’s natural father and Nadia Bukayeva the sultry niece of a Turkish bookshop owner. Max is aware of a German agent – Felix Lemmer who also knew his father, he is also aware that the Japanese have employed an agent to kill Lemmer, but who is he working for? Who is the mysterious Arab boy known as Le Singe who seems to walk into locked rooms at will!? Although this book is complete it is actually part one as there will be a sequel, quite a novel departure for the author. 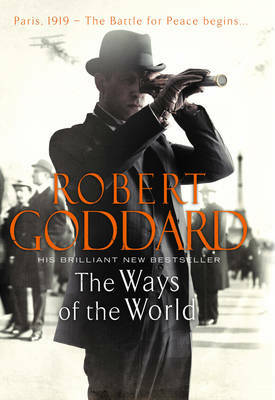 THE WAYS OF THE WORLD is well up to the author's high standard. Very much recommended.